I love everything about this book starting with just the way it looks! Great cover art and I like that Holly was so involved in that. It is the book that I consistently recommend and even after all this years unschooling still will pick it up and open up to a page just because I know that I will love what I read. "If your child is more important than your vision of your child, life becomes easier." I've already had lots of personal revelations and healing through reading your book and I didn't expect that when I first picked it up. So my daughter's life is already different and better because of your work. Reading your book helped me make my relationship to my husband so much better. I only read the book a week ago and I already see a difference for the three of us. Our daughter is also so much happier because we are. The story of a moment when the Big Book served well as a Ouija book. "the...quote leapt off the page at me. Really at me. It got me right between the eyes...and thank god, it buried itself right in. I just loved your book. We have been on this unschooling journey for nine years now, and just when I need it most, encouragement and inspiration seem to find a way to me. Your book is the encouragement and inspiration that I needed most recently, and will return to again and again in the future. Although I've only read about 100 pages I feel more confident than I ever have about keeping my children home. I feel supported and sane which are priceless gifts to a parent. from an effusive testimonial by C. W.
Finished your book. Loved it. Will want to read a second time. 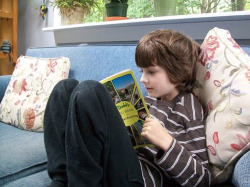 I'm currently reading your Big Book of Unschooling - I'm so glad you did this work, because it's easier to read than onscreen (I must say that I read it mainly in the bathroom). This reading has given me a gift that is incredibly precious for a mom of 4 under 10. It has given me ENERGY. Such a positive energy—it is a real blessing. I'm as tired as ever, but it has half the importance it had the week before I ordered your book. Natalijoi, in the chat, wrote of this book: "It's hoparoundable." I have been enjoying your book. I usually read it when I am nursing my little girl (Anna- she's 2) to sleep. Tonight she took the book from me and wouldn't give it back. She kept finding all the pictures of your children as babies. She pointed to the picture of Holly as a newborn and said hold her...mine! I want that! Then she said (about the book), "Read it! Read it! "So for fifteen minutes we "read" your book and she savored all the baby pictures. On the picture w/ Marty and Holly in the sandbox she pointed to Marty and said, "That's the kid." Then she pointed to Holly and said "Kid loves baby." Just thought you would be happy to know that your book pleases all age groups!!! Because Pam Sorooshian was going to write the foreword, I sent the manuscript to give her an idea of the book, about 2/3 finished. I expected advice and ideas, or a "good job, don't forget [this or that]." Pam has given me permission to share what she wrote. The BOOOOOOK is amazing. I'm SO excited. It is fantastic—it is the unschooling book that I've always dreamed of. Seriously!!! It is absolutely superbly wonderful. It is so FULL and clear and --- people are going to go nuts over it! I can't possibly express how much I love it - I'm ecstatic. Thrilled!! I cannot WAIT for it to be available. 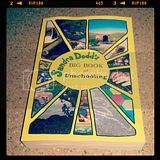 I am so ecstatic to have received your Big Book of Unschooling a couple days ago - I can't put it down! I have been reading your website and the Always Learning list for a couple years now (although I have yet to post anything). This book is like the icing on the cake since my husband and I can pick it up and read it anywhere. I love how it is organized, and I refer to different pages depending on my question or concern. There are pages in your book that bring me to tears. Your clear and logical words have helped our family tremendously! I received Sandra Dodd's Big Book of Unschooling in the mail the other day, and not only was I impressed with the neat wrapping (tissue paper around the book — I felt as if I was opening a birthday present!) but I was beyond impressed with the experience of having the book. It is exactly like holding Sandra's unschooling website in your hands, which is what she wrote it was intended to be. It is a household necessity. Like a toothbrush! Or a flashlight! Yes, it's just like those two things, because you need it during ordinary times and during emergencies. note from Sandra: You might need to read the intro to appreciate that. I love the look of your book. Like your son, Marty, said about this book, I believe it is a great book to just open and read ideas in an unrestricted manner. I've always loved your website, but I find this book helpful as I can refer to it anytime without going to the website to search for my question. I can even see a purpose for having a few copies in different rooms! Thank you for collecting, writing, and sharing such great ideas. —Beth Moore More notes about "just open" and other random factors. "Beginning with the profoundly accurate statement: "Neglect is not unschooling." I was drawn into this book so entirely that I didn't want to put it down. This great read was over so quickly. Well, quickly for 350 pages. I thoroughly enjoyed the whole book." 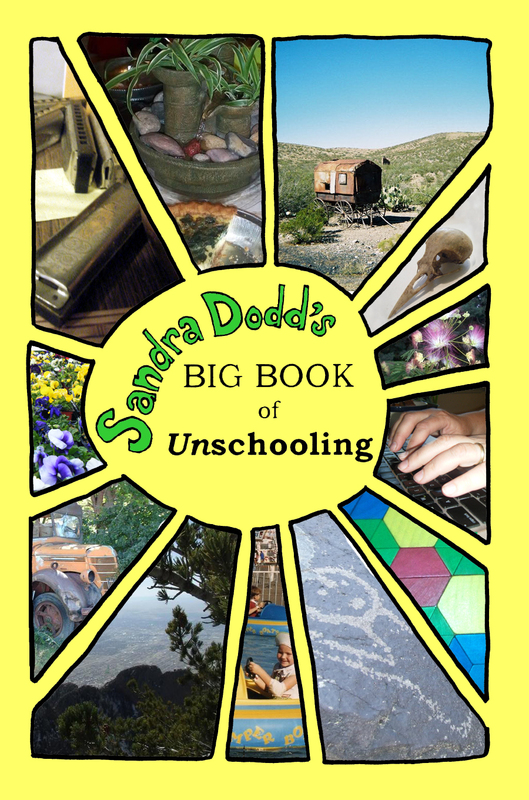 Click here to go to order Sandra Dodd's Big Book of Unschooling.